The fabric for this blouse started life as a 1950s skirt, but was teensy tiny and pretty faded, so a re-purposing I did go! I had a hard time finding a pattern that could fit the yardage I had, but ended up with Simplicity 4530. This seems to have been a very popular pattern in the 1950’s because I see it pop up all the time online (I think I’ve owned at least two copies of this myself). I often wondered why, but after making it up I can say I truly do love this pattern and I know I’ll be making more shirts from it and wearing this one all the time! It really was one of the fastest blouses I have ever made, after figuring out how to cut so I had enough to make this. I did have to piece the facings and I did not have enough to add the bias cuffs, but no biggie- I just used “hug snug” seam binding on the inside. It’s funny- the lines of the blouse are almost mid 1930’s with the wide collar and cut of the sleeves, but with the nice fitting of double release darts so common in 1950’s blouses. I love the fabric. It’s kind of “Blue Man Group” meets 1950s novelty fabrics meets “I want to be a world traveler”. I paired vintage buttons with it and I really think it looks pretty original. Woohoo for projects coming together! >That's so cute! I usually ignore 50's patterns, but after seeing this one made up I think I need to keep an eye for for this one! >Thanks, gals!Sorry, Miss Dollie- I want to keep it. But I'm flattered! >Believe it or not, I have never made a real blouse (with buttons, collar, etc.)!!! This one is awesome and just the inspiration I need to try something new. It still has to get in line behind Mary's prom dress and the other three or four half-finished projects I have going though. >I posted this and then it disappeared????!!!! You may not believe it, but I have never made real blouse with buttons, collar, etc. This one is awesome and the inspiration I need to try something new! Although, it does have to get in line behind Mary's prom dress and the three or four other half-finished projects that I have going!!! >Love the fabric! I had a serious love affair with all things Ancient Egyptian growing up. (Some kids liked dinos, I liked pyramids.) 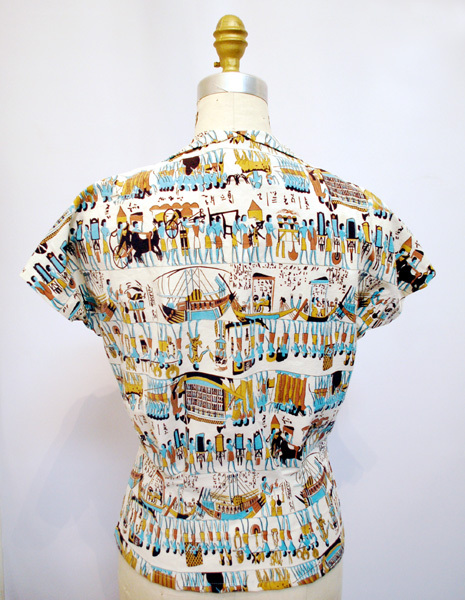 I've been keeping my eye out for some novelty Egyptian fabric. >I saw a REALLY similar fabric in the LA garment district this weekend! >Amazing, I adore novelty fabrics. 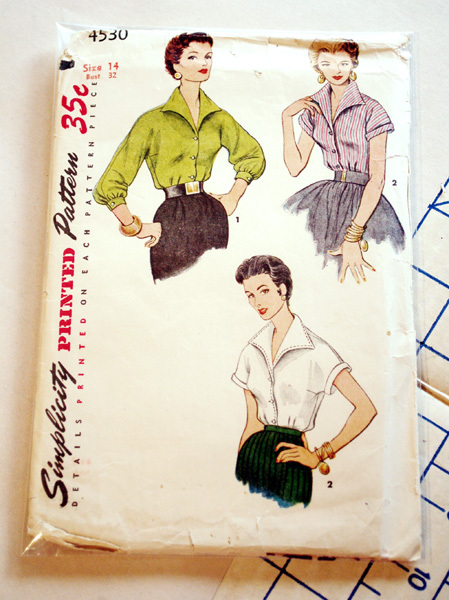 I have a hard time finding vintage blouses that fit so I love the idea of repurposing an old skirt into a blouse. >Very cute Lauren and I was just having a wardrobe dilemma tonight and found a I have some great pencil skirts that fit me pretty will but not blouses to wear with them. I will have to go through my stash and see if I own this pattern. >That looks great! I have some great fabric that needs repurposing too. I have that pattern as well, and yes you're right I see it all the time! >Lovely fabric always enjoy looking at what you have made. 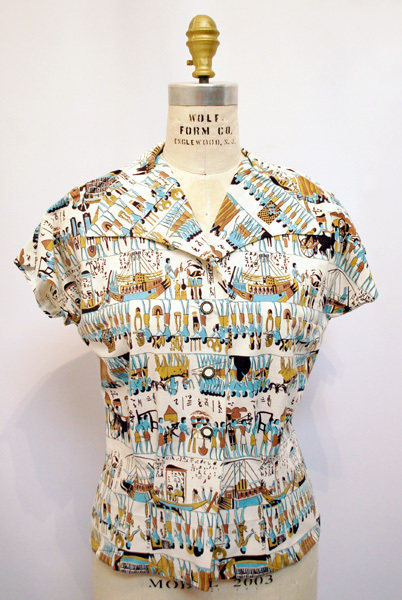 >*swoon* OMG I love crazy novelty prints so much! That is fabulous! >Oh my goodness, I absolutely adore that! I've eyed that pattern before and thought I'd purchased it but apparently not. Now I definitely think I'll be on the hunt. I love interesting collars but sometimes think standard convertible collars look too busy with some of the novelty prints I'm always drawn to. 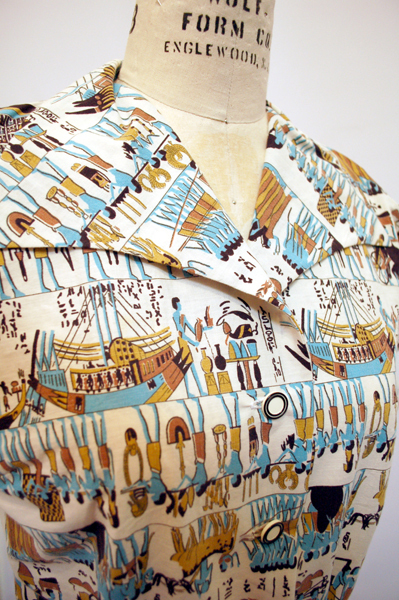 But what a stunning match this one is with the Egyptian print! I could just see this with some casual wide leg trousers or a skirt and sandals! >I really like that a lot it's so cute!!! Every time I am on your site I'm more and more inspired to work harder at making my own clothes. >Thank you all so much!I wish I had thought of scanning in the fabric before I made the blouse! Darn! I have some scraps but none big enough to show the whole pattern. Next time I have a cool vintage fabric I'll have to do that! >I swear I was eying that pattern somewhere on etsy the other day!